I always know when I pick up a Stephen King novel that I'm in for a hell of a wild ride. The Outsider is no different, taking this graphic and horrific murder in small town America and turning it on it's head with a supernatural element that I couldn't have guessed at if I tried. The story initially presented seems impossible: a much beloved local hero is accused of viciously murdering and violating a boy, something that seems to be backed up by eyewitness testimony and DNA evidence no matter how much the accused swears he didn't do it and that he was actually out of town at the time. Then video corroborating his story shows up. How is this possible? How can a man seemingly be in two places at once? Here begins the real fun as Detective Ralph Anderson and others work to decipher what went on and who the real killer is. I won't say anything else about the plot as this is definitely one you'll want to see unfold for yourself. I listened to this story as an audiobook and I think the narrator (Will Patton) did a good job of keeping the tension tight and the listener engaged throughout the many twists and turns the story took. He also did a great job of changing his voice to differentiate between characters and to give us some particularly unique voices, especially Holly Dibney, a character who appears in other installments of this "Finders Keepers" series. I actually didn't even realize this was part of a series until after I read The Outsider, but I've now added the rest of the series to my listening lineup. And Will Patton is again the narrator, so that's a wonderful surprise! The Outsider has quite a lot more interesting aspects that I want to discuss but I'm wary to do so in case I give anything away. Just know that it's graphic at times but also filled with really interesting and relatable characters. The supernatural aspect is delicious and really takes this story down an unusual road that's entertaining to say the least. If you are already a fan of Stephen King's novels you will most likely really enjoy this one as well. It's definitely unsettling! It's also intriguing to see the world turned on it's head, making someone just picking it up wonder why that might be, and why the man's shadow has red eyes. Simple but effective for sure! 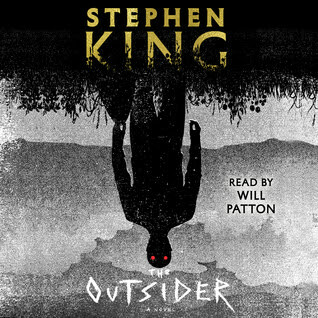 I borrowed a copy of the audiobook version of The Outsider from my library's Overdrive account. All opinions are mine alone. To find more information about the book, including other reviews and links to where you can purchase a copy, see Goodreads HERE.